The world experienced the most amazing birth of 2015 when Queen + Adam Lambert performed in London’s Westminster Hall. The concert lasted for over an hour, splitting off at midnight to Big Ben for the biggest fireworks show I’ve ever seen. Thank you BBC for so graciously streaming the entire show to the world! According to Digital Spy, BBC had 5.83 million viewers for the concert up to the fireworks, 12.32 million during the fireworks, and 10 million stayed for the continuation of the concert. Add to that the millions who watched the actual live stream and the multi millions who watched the YouTubes. 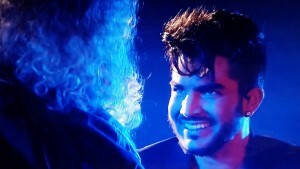 Twitter was on fire with converted naysayers and new fans waking up to their new-found Adam Lambert obsession! No-one can replace Freddie Mercury, but @adamlambert makes it pretty damn close. Always excited to sing, Adam seemed especially happy on stage that night. 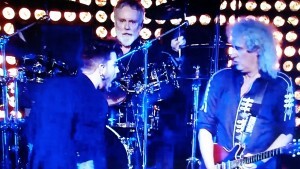 It’s easy to see how far the comradery between Brian May and Roger Taylor has progressed with Adam. Remember his first full-length concert with Queen in in Kiev (June 30, 2012)? Adam was so excited to be on stage with these rock Gods and how deferential he was, many times bowing to Brian. Now he is so comfortable with them, performing with a relaxed ease. Not only have they shared the stage together for what may be Adam’s longest stretch, but Adam is also Queen’s longest singer, after Freddie Mercury of course. The following video (courtesy adamlambert_pic) shows the entire BBC performance. The fireworks follow below. 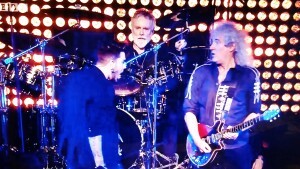 At 48 minutes, Roger and Brian show their amusement with Adam’s latest rendition of Killer Queen. At 51 minutes, bringing in We Will Rock You with bagpipes was certainly fitting! During We Are the Champions, the whole performance is priceless! 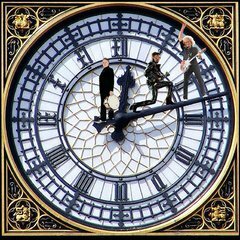 Both Brian and Roger have shown their musical mastery during the concert, and at 58 minutes, watch Brian and Roger appreciate Adam’s mastery of his instrument. This is followed by the back and forth between Adam and Brian with the most comical facial expressions! 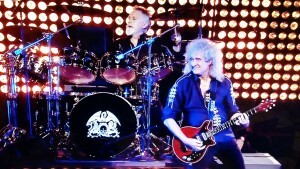 Resulting from this spectacular concert, both Queen and Adam Lambert have seen increased sales in their music. Check it out here where my good friend @glitzylady put it very well for another blog. Nice to see @adamlambert was the top Google search in the UK. Late last night and this morning. And 4 days later, Twitter is still buzzing! 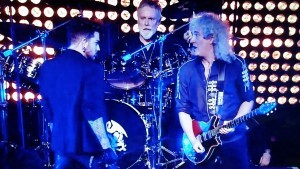 If you haven’t seen the NYE concert by Queen + Adam Lambert then go and watch it. Amazing. Adam Lambert is the perfect front man. While we will be enjoying bringing you much of Adam’s upcoming European tour with Queen, we are patiently waiting for its conclusion so we can be that much closer to the release of his third album! Enjoyed reading your blog very much – those facial expressions are priceless – boys having so much fun – looking forward to 2015! Absolutely awesome concert. Watching the video made me feel as if I were there in the audience. Great performances by Adam Lambert and Queen. I grew up on listening to Freddy Mercury and this futuristic rendition was even more beautiful than I could ever have imagined. Amazing performance as usual! YAY!!!!!!!!! !